This study examines the theological trend that has recently taken on an identity as "post-conservative" evangelicalism. 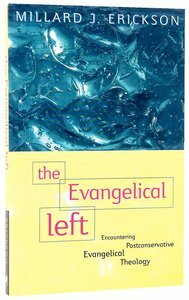 Erickson briefly surveys the history of the evangelical movement, setting post-conservatism within its context before considering the theological methodologies of four representatives of the evangelical left - Bernard Ramm, Clark Pinnock, Stanley Grenz, and James McClendon. Based on this sample, he analyses the strengths and weaknesses of the movement and critically evaluates the proponents' responses to three particular doctrines: scripture, God and salvation. A must for all who are concerned about the future of evangelicalism. From OM Lit. Millard Erickson (Ph.D., Northwestern University) is Distinguished Professor of Theology at Western Seminary, and the author of the widely acclaimed systematics work Christian Theology along with more than 20 other books. He was professor of theology and academic dean at Bethel Seminary for many years. His most recent book is of some importance Who's Tampering with the Trinity? An Assessment of the Subordination Debate, in the light of recent attempts to place the Son in an eternally subordinate position to the Father.